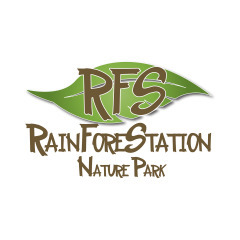 Set on 100 acres of World Heritage Rainforest, Rainforestation is a unique tourist attraction situated five minutes travel from Kuranda Village, and half an hour by Coach from Cairns. 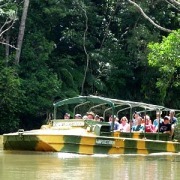 This eco-friendly Kuranda attraction hosts Army Duck Rainforest Tours (with Tropical Fruit Orchard), Pamagirri Aboriginal Experience and Kuranda's largest Koala & Wildlife Park. 1974 – Locals Charles and Pip Woodward purchase the property as an orange orchard, named Mountain Groves. 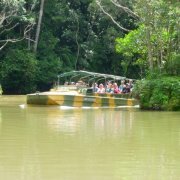 1976 – The park is officially opened as a tourist attraction, with amphibious Army Duck tours and the Colonial Restaurant. 1988 – Boomerang throwing commences, introducing aspects of Aboriginal culture to the Rainforestation experience. 1993 – The Pamagirri Aboriginal Experience launches with the introduction of the Pamagirri Aboriginal Dance Troupe and Dreamtime Walk. 1996 – Rainforestation celebrates its 20th Birthday with the opening of the new Koala & Wildlife Park - the 5 metre crocodile Jack is flown in from Darwin on a Qantas jet! 2001 – Tropical Fruit Orchard opens. 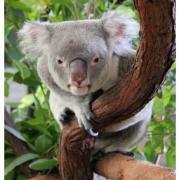 2003 – A new Koala Experience opens, enhancing the opportunity for visitors to have their photo taken cuddling a koala. 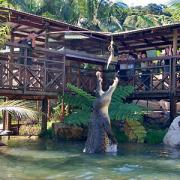 Winner - Australian Tourism Awards for Significant Local Attraction. Winner - Queensland Tourism Awards for Significant Regional / Local Attraction. Winner - Tropical Tourism North Queensland (TTNQ) Awards - Charles Woodward for Significant Contribution from an Individual. Finalist - Philippa Woodward – Telstra Business Women Award. Business Review Weekly Top 100 Fastest Growing Private Companies for Outstanding Performance in Business. Australian Tourist Commission Certificate of Excellence, Share Booth Category, Australian Tourism Exchange. Regional Winner - Australian Small Business Awards. ITOA Outstanding Services and Contributions to Australian Inbound Tourism.